Dr. Alexander John Thompson was a British statistician, the author of the last great table of logarithms, published in the period 1934-1952. His table, the Logarithmetica britannica, gives the logarithms of all numbers from 1 to 100000 to 20 places and supersedes all previous tables of similar scope, in particular the tables of Henry Briggs (1624), Adriaan Vlacq (1628) and Gaspard de Prony (1790s). Alexander John Thompson was born in 1885 in Plaistow, Essex, England. In 1905 he entered the Civil Service and served in a number of government departments. In 1920, A. J. Thompson joined the statistical staff of General Register Office, Somerset House, London. Until his retirement in 1945, he was engaged in designing and writing official statistical reports on births, marriages, and deaths and on the Census of England and Wales. A. J. Thompson was a B.Sc. (1911) and Ph.D. (1927, for Logarithmetica Britannica, parts IX (1924) and VIII (1927)), from University of London. He was a member (1928-1965), vice-chairman (1938-1947), and chairman (1947-1948) of Mathematical Tables Committee of the Royal Society. Alexander John Thompson died on June 17th, 1968, in Wallington, Surrey. Thompson started his project of a new table of logarithms in 1922, celebrating the 300th birthday of Briggs' Arithmetica logarithmica. Initially he started calculations of the tables with a single commercial mechanical calculating machine. However, he realized soon that with a special differential machine for processing four or five differences the work could be done much easier. Thus he constructed a machine (called Integrating and Differencing machine), consisting of four successively arranged individual machines, standing on a staircase-shaped box and connected to each other (see the figure below). The assembly was made by the German company Triumphator in Leipzig-Mölkau. The individual machines were conversions from commercially available machines, expanded to 13 locations in the input mechanism. Thompson's desire for a printing unit and for mechanisms for automatically performing calculations failed because of the too long development cycle and the associated high costs. 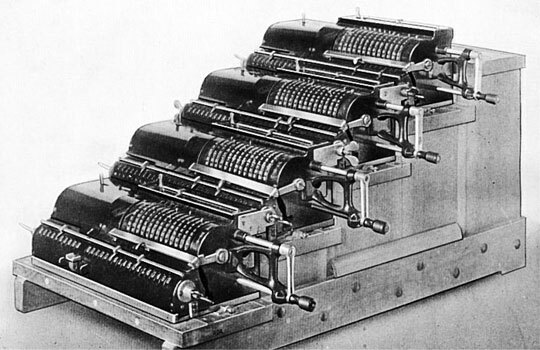 A detailed description of the Thompson's method of calculation and machine was compiled by Mr. Stephan Weiss (Die Differenzenmaschine von A. J. Thompson und die Logarithmetica Britannica).